In 1755, Major General Edward Braddock was dispatched to command the British and colonial forces in North America. His major aim was to capture Fort Duquesne, the most important French position in the West. In June, Braddock’s force, numbering 1,400 regulars and 450 colonials under George Washington, began its push into the interior from Fort Cumberland on the upper Potomac. On July 9, at a site about eight miles from Fort Duquesne, an estimated force of 300 French Canadians and Indians surprised Braddock’s army. They poured deadly fire into the ranks from positions hidden in the heavy woods on either side of the path. General Braddock adhered to his accustomed manner of warfare and refused to allow the colonials to take the fight into the forest. Perhaps his most serious error was the failure to heed intelligence reports offered by Indian scouts; Braddock regarded the natives as inferiors and refused to deal with them. General Edward Braddock commanded bravely – four horses were shot out from under him – but was mortally wounded and died several days later. Washington had the general's body interred under the road over which the soldiers and wagons passed in retreat, hoping to spare it from desecration. Braddock’s defeat was complete. The French reigned supreme in the West and the Lenni Lenape and Shawnee, sensing British weakness, began a brutal series of raids against frontier communities, particularly in western Virginia, Pennsylvania and Maryland. Conditions became so critical that many settlers abandoned their homes and retreated east, providing one example in American history when the frontier moved toward the Atlantic rather than away from it. The necessity to defend the western frontier to some degree accounted for the poor British performance in other theaters in 1756 and 1757. Little support or direction was received from London. Military campaigns in this period consisted almost entirely of efforts to capture the frontier outposts. One positive result from this disaster, at least from the American perspective, was that the roadway and bridges so laboriously carved out of the wilderness by Braddock's men remained and would serve as the chief highway for later settlers on their westward migrations. 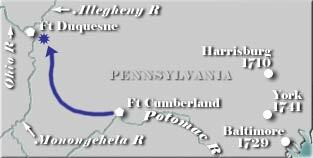 Legends & Lore of Western Pennsylvania by Thomas White.